Below you will find a large collection of MRSA pictures and Staph infections pictures. 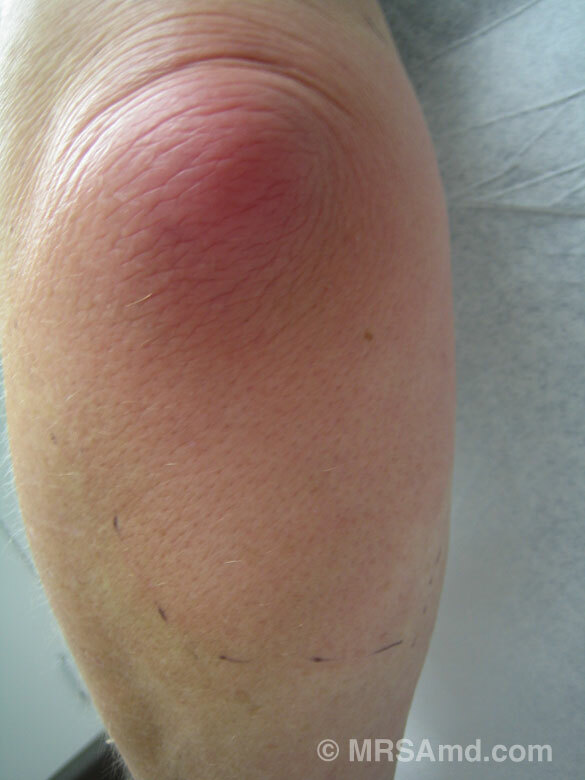 These photos, taken of our patients, will help you identify some of the more common characteristics of MRSA skin infections. 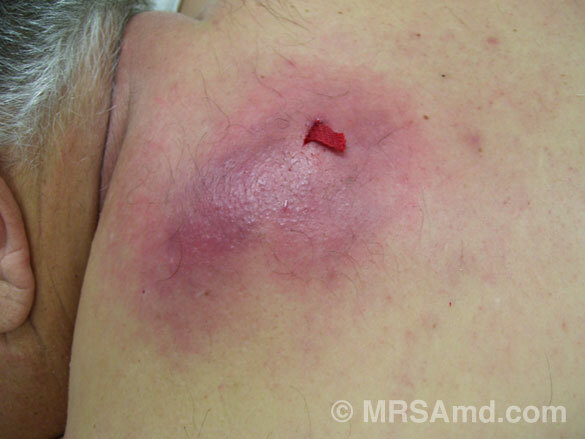 MRSA is a mutated form of Staph bacteria. 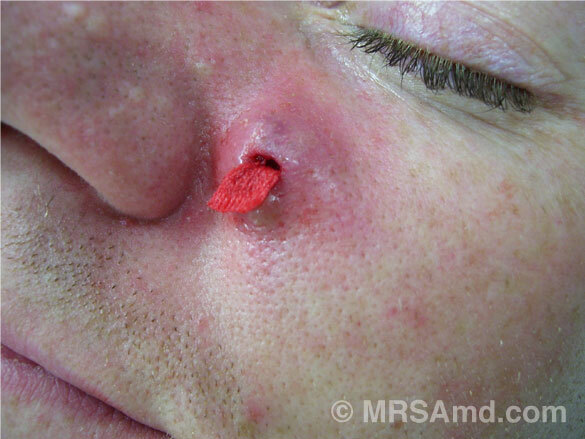 MRSA and non-MRSA Staph infections look the same on exam; therefore, we have included pictures of both. It’s important to note that non-MRSA Staph bacteria can form the same life-threatening infections that MRSA can. I want to personally thank all our patients who have graciously consented to have their pictures uploaded for your benefit. They continually inspire and teach me. 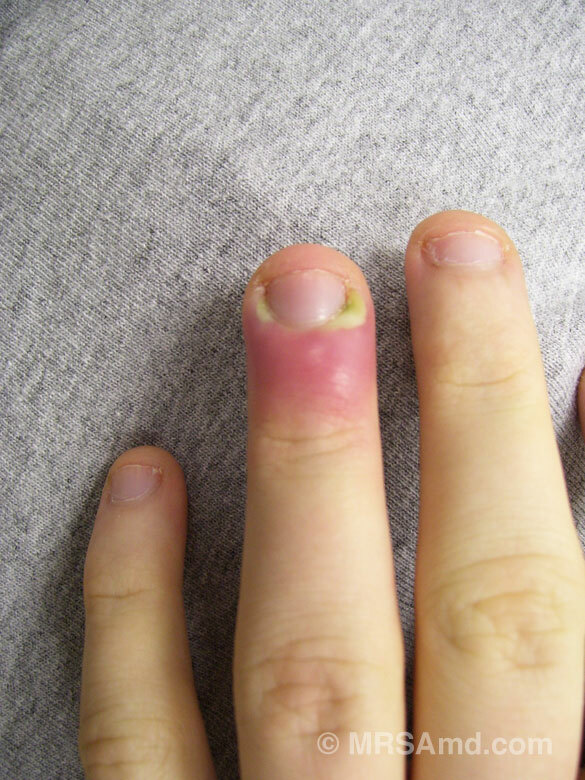 Finger abscess (paronychia), secondary to MRSA. Treatment included surgical drainage and antibiotics. 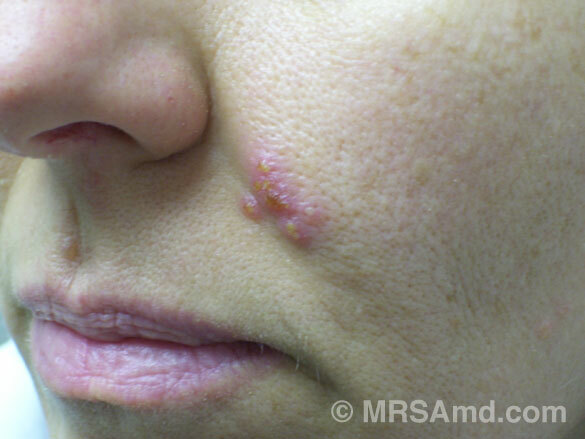 Impetigo or “scalded skin” secondary to MRSA. 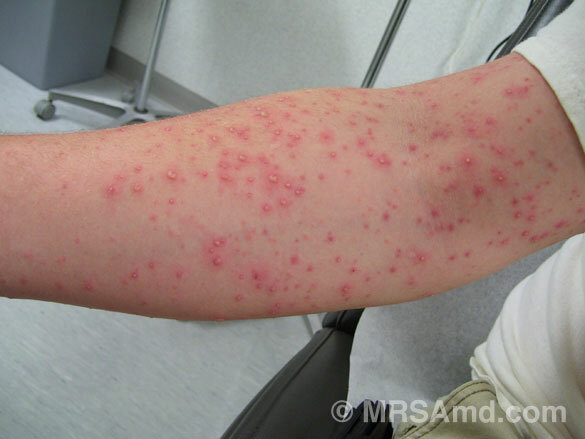 Diagnosis: MRSA per culture of concurrent hand abscess. Multiple pustules on arm developed in 24hr period of time. Diagnosis: Staph infection, treated with antibiotics. 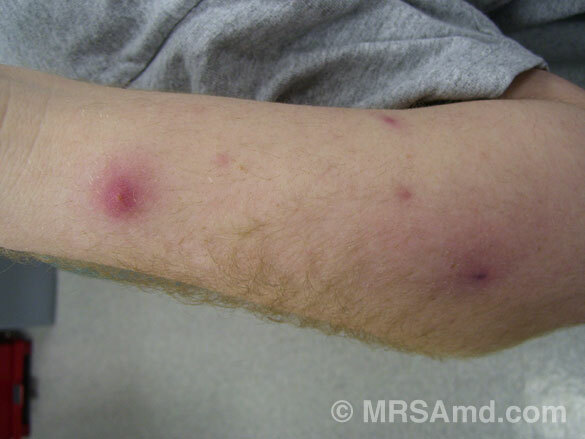 Infected arm, multiple pustules, secondary to MRSA. Treatment: surgical drainage and antibiotics. Abscess behind the ear after surgical drainage and placing wick. The wick allows for continued drainage, but it is not always needed. Infected knee secondary to Staph. 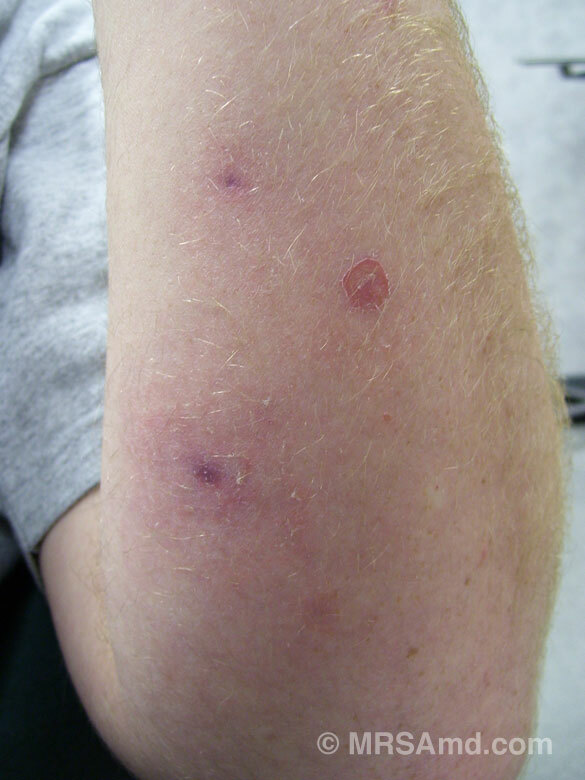 White appearance to the wounds secondary to use of topical antibiotic ointment. 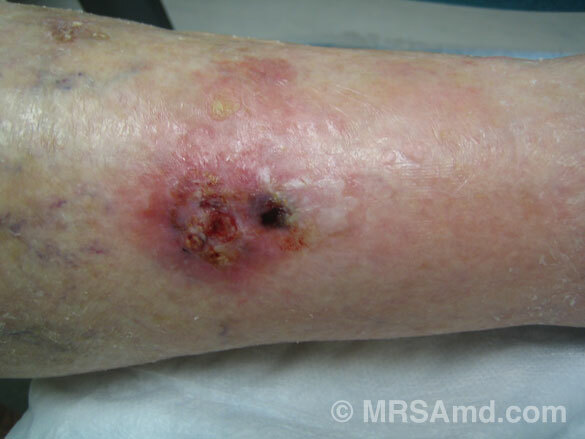 Cellulitis/abscess of lower leg secondary to MRSA. Wick placed after surgical drainage of abscess. The wick allows for continued drainage. 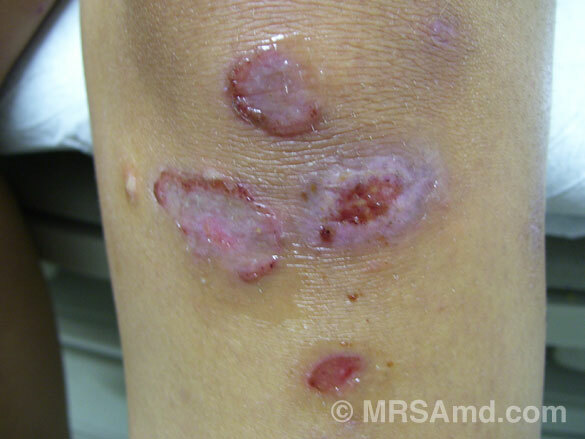 Cellulitis of the knee with pustule in center. Behind the knee infected sebaceous cyst/abscess. Elbow infection/abscess/bursitis secondary to Staph. 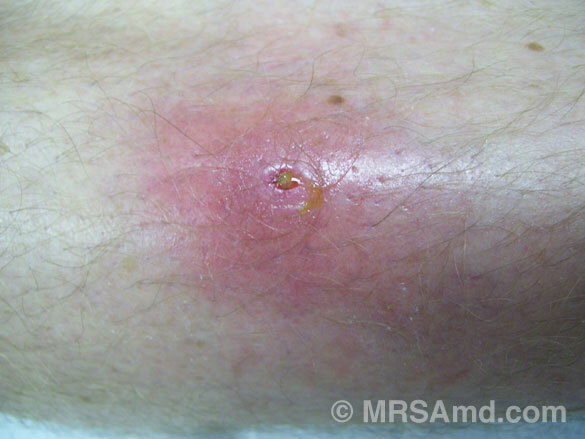 Lower leg abscess that spontaneously drained – Staph infection. 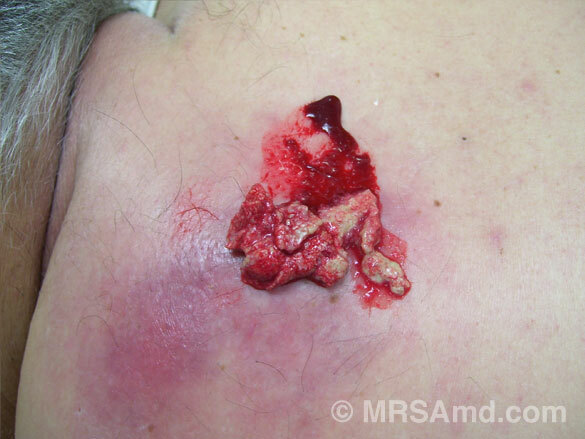 Squamous cell carcinoma infected with MRSA. Cellulitis/abscess lower abdomen secondary to Staph. Notice the central wound where the abscess has spontaneously drained. Classic herpes infection (cold sore), not to be confused with impetigo. Cold sores can occur anywhere on the body that comes in contact with a herpetic infection. Small abscess on the face that was surgically drained. The wick was placed to allow for continued drainage. Elbow abscess after surgical drainage. 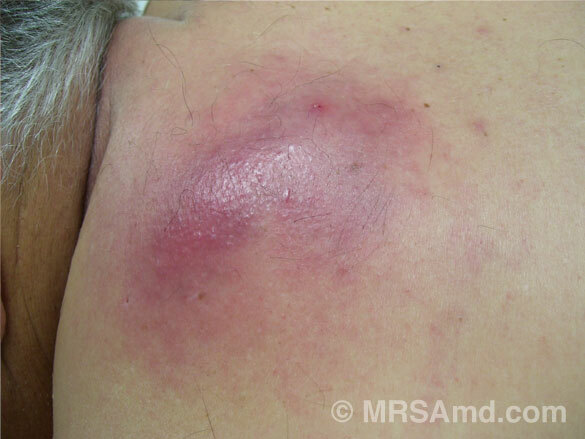 Large area of cellulitis on the upper back. The skin tissue was "spongy" indicating an abscess lurking below. Original drainage out of the abscess. The procedure of expressing out this thick pus was continued until all the pus was removed. More pus. This procedure needed to be repeated four times before all the pus was removed. A wick was placed to allow for continued drainage. Looking for answers to defeat MRSA? Click here to learn how you can be free of the worry of MRSA. We care and we’re here to help. You are not alone!